Eugene Bakeler (1855-1923) was born in Strasbourg, Alsace, France on February 26, 1855, the son of Eugene Bakeler and Anastasia Munch. He arrived in America in 1859, probably at New Orleans. Circa 1877, Eugene married Laura Hasling, probably at New Orleans. From this union two children were born in the Crescent City: Joseph Bakeler (1879-1895) and Arthur Francis Bakeler (1884-1939). It is not known if Eugene Bakeler’s marriage to Laura Hasling ended in divorce or her demise, but on October 24, 1888, he married Marie Adoraline Chevalley (1865-1940) in New Orleans. She was the daughter of Emile R. Chevally and Julia Modere (1841-1915) also of New Orleans. They had one child: Albert L. Bakeler (1889-1973). Eugene Bakeler and spouse adopted Marshall L. Michel (1886-1954), her nephew, and son of Jules T. Michel and Dora Chevally (1868-1890). Arthur F. Bakeler (1884-1939) married Ione [Ina] Murphy (1899-1971). Children: Marie Bakeler (1923-2010); Arthur F. Bakeler II (1925-2011) m. Marie Emilie Mayer (1925-2010); Mildred Bakeler (b. 1927? ); and Alfred Smith Bakeler (1928-1978). Albert L. Bakeler (1899-1973) married Teresa C. Sumrall (1898-1980). 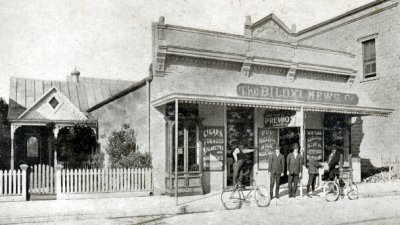 They resided at 601 Claiborne Street in Biloxi, Mississippi where they reared Verne Bakeler, a daughter, and their only child.
. Eugene Bakeler had commenced his business career as a check boy in the store of D.H. Holmes, and rose to the position of salesman at the age of eighteen. 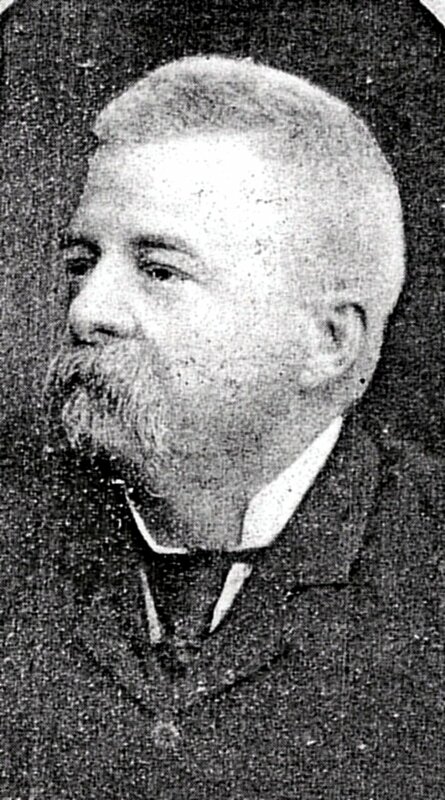 Mr. Bakeler came to Biloxi in the late 1880s from NOLA. He served as alderman under ex-Mayor Ladnier's [Laudner] administration and made a good reputation as such. He always had a fascination for the news business, buys direct from the publishers and has the finest establishment of its kind on the Gulf coast. After the destructive fire of November 1900, Eugene Bakeler was the first doing business in the burnt district which speaks well for his pluck and enterprise. He was not selfish, but attributed his business success largely to his estimable wife. Mr. Bakeler was a strong advocate in the election for the Gulf & Ship Island Railroad, and believed in the future prosperity and greatness of Biloxi. Mr. Bakeler was a member of the Knights of Honor. He expired at Biloxi on April 25, 1923. Maria Chevally Bakeler died on January 6, 1940. The home next door is the Bakeler residence at 431 Reynoir. Eugene Bakeler and Marie A. Bakeler were the parents of Albert L. Bakeler (1889-1973). He worked in the shop as a clerk. My mother was Mildred Agnes Bakeler, or Inez Thomise Bakeler (official birth certificate-Biloxi MS),( April 24, 1926-Jan 6, 2007). Since the Arthur Bakeler family broke up in 1930, theIr boys, ARTHUR and ALFRED were sent to an orphanage where life was harsh. Mildred lived with several relatives in a short amount of time, and finally lived with the Albert Bakeler and Teresa Summreal family, with sole cousin Verne, and Albert's mother Adoraline Marie Chevalley Michel (1940). There was also an older brother to Arthur named Joseph(1899), born to Eugene's first wife, Laura Hasling (1866). Arthur Jr and Alfred set up household when Arthur aged out of the orphanage (1938) and brought his younger brother with him. Although Mildred does not show up on the 1930 census, in a subsequent census dated 1930, she does appear as a resident of the Albert Bakeler household. Mildred graduated from the local Catholic girls school in Biloxi in 1944. She worked briefly in civil service at the Military base, but left soon after to New Orleans' L'hotel Dieu, where she enrolled in the Nurses Corps, supporting the war effort . She left upon graduation for San Diego Ca 1948, to work in a hospital. She was estranged from most of the Arthur Bakeler family for the rest of her life. She did maintain family relationships with Albert and Teresa Bakeler, her uncle and aunt, and especially Floyd and Verne Lamas. There are 3 Bakeler adult children from Verne and Floyd. Biloxi City Directory, Biloxi, Mississippi,Volume 1, 1905, (The Biloxi Daily Herald Printery: Biloxi-1905), p. 40. Harrison County, Mississippi Circuit Court, "State v. Eugene Bakeler", October 1909. The Baton Rouge Advocate, "Marie Emilie Mayer Bakeler", April 15, 2010. The Baton Rouge Advocate, "Arthur F. Bakeler Sr.", January 15, 2011. The Biloxi Herald, "City News", June 30, 1894, p. 8. The Biloxi Herald, "The death of Joseph Bakeler", March 30, 1895, p. 8. The Biloxi Daily Herald, "Barber has brainstorm, says Bakeler", October 29, 1909. The Daily Herald, "Bakeler is a candidate", April 21, 1916, p. 5. The Daily Herald, "Eugene Bakeler ill", October 24, 1921, p. 3. The Daily Herald, "Albert L. Bakeler", August 16, 1973, p. 2. The Daily Herald, "Mrs. Teresa Sumrall Bakeler", December 26, 1980, p. A 2. The Times Picayune, “[Arthur F. Bakeler] Held under the White Slave laws”, February 22, 1917. The Times Picayune, “Deaths [Ina Bakeler]”, November, 1971. The Times Picayune, “Deaths [Alfred S. Bakeler]”, October 5, 1978.